The first thing you notice when you open this book is the use of a very interesting illustration style - on every page the illustrator, Nina Sabnani, has mixed photographs of real saris with paintings/drawings of little children playing with the saris, resulting in a visually appealing, vibrant artwork. This book is sure eye candy! We enjoyed the text, but, honestly I would have loved to see more text with the visuals. Reading it the first time with my 4 yr old, I felt, it's definitely one of those books that make you go Wow! - but, is that all - why did it have to end so fast? I thought, the text on each page should have been at least half the length of a sari, if not the whole length! :-)May be, the author kept the text simple in order to let the visuals do the talking, and thereby allowing the child to focus on the beauty and elegance of the different sari pictures, and imagine herself/himself in the visuals...It can serve as a great "read-it-yourself" book for kindergarteners and kids in early elementary grades. Playful and fun, this book will capture the imagination of toddlers and preschoolers alike. My 4 yr old enjoyed the book. I could tell from the expression in her eyes - yet another neat book to add to my collection of books about India! 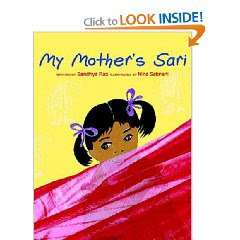 I have done that a lot when I was young - much to the dismay and anger of my mother -- "wipe my nose and face on her saree"
Also, I wonder about the spelling - I am used to the spelling saree; but, this book uses sari.. wonder if it is american version of the spelling?? Neat. I'll keep an eye out for this. Another sari book coming out this spring is Mama's Saris, by Pooja Makhijani. The illustrations are lovely, as is the story. 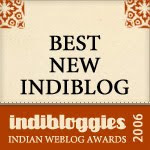 Sari vs. saree - I think sari is certainly a more popular spelling in the US. It's also a Hebrew name, derived from Sara, interestingly. Thank you for all your wonderful comments on the book and review. @ - I would love to check out the blankie book that you've mentioned...! thanks all! will be back this week with another one! Stay tuned! Praba - here's the book I was talking about - I'm sure your daughters will enjoy it! 'just happened to stumble across this page while image-googling for 'Sarees'. Sounds like a book I'd definitely love to read! as I simply love Sarees- even though I'm not a woman, I probably am more crazy about it than most of them today are! LOL! While I could be happy jus looking at Sarees I guess, there's be nothing like it if I could find a life-partner who'd love to wear them always! And I'm sure I will!